Into the Storm is as classy and staid a piece of TV movie historical fiction as there ever was. Excellent performances all around, lead by Brendan Gleeson chomping at the bit as the old British Bulldog Winston Churchill. Immersive production values beautifully recreate Great Britain and other locales circa 1940-1945. 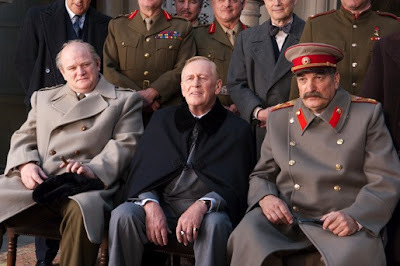 Convincing makeup and performances by Aleksei Petrenko as Stalin and Len Cariou as FDR made their scenes with Churchill the most compelling of the picture. The largely un-reciprocated admiration Churchill held for Roosevelt and their mutual distrust of Uncle Joe Stalin were major themes that was handled particularly well. It's unfortunate that Into The Storm's running time presents a Cliff's Notes version of World War II from Churchill and England's perspective. History would have been better served if Into the Storm were a multi-part mini series. Enjoyed Into the Storm more than its predecessor The Gathering Storm overall, but I wonder if history actually records Winston Churchill gave Franklin Delano Roosevent a full monty?